This is the part of Manhattan that allegedly needed to be sawed off, fifty years after the hoax. Note that it still hasn't sunk by this point. One of the better known hoaxes in the history of New York City is the famous “sawing off” of the lower end of Manhattan. The story goes that a ship’s carpenter, a man known simply as Lozier, got to talking with a number of lower Manhattan tradesmen one day in 1824 about how built-up the island was getting. 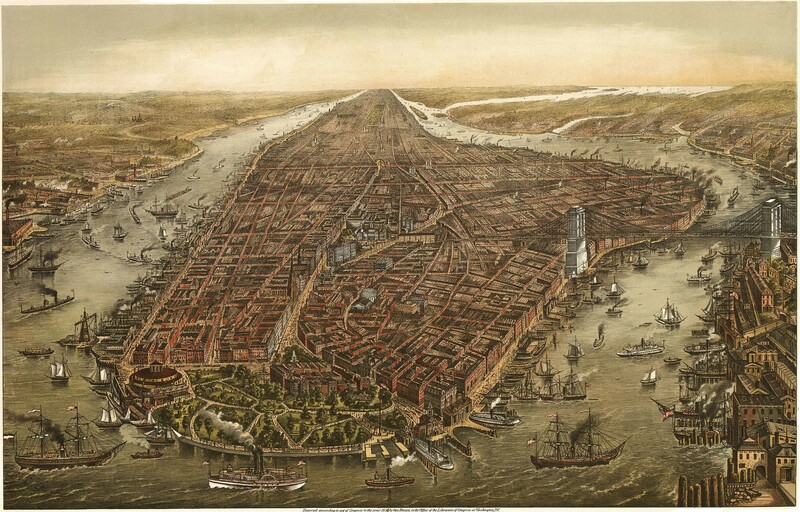 The story goes that it was widely feared that lower Manhattan would get so heavy with buildings that it would tip over and sink into the harbor. A solution was proposed: cut the lower part of the island off, float it out into the harbor, spin it around 180 degrees, and reattach it, thus balancing out Manhattan and preventing it from sinking. Lozier gathered a number of workers who met at where the Bowery and Broadway split, and another group to meet at the corner of the Bowery and Spring Street. They were to be ready to work, and save Manhattan Island! On the day the project was supposed to start, the workmen were there, but Lozier wasn’t. Naturally the workmen were furious, and naturally Lozier made himself scarce for a few months! Somewhere along the way, people realized that since islands don’t float, they won’t sink. Thus was born a legend allowing all of us, no matter what we do, to shake our heads and marvel at how stupid other people can be, and we’ve been marveling at this story for… how long? Well, though this is said to have taken place in 1824, the first written account of the Sawed-Off Manhattan Hoax dates from 1862. By this time, Lozier was long dead, and there wouldn’t likely have been many victims of this prank still alive. Researchers have searched archives of New York newspapers from 1824 and all over the 1820s, and have found nothing referencing this hoax. So what does this mean? What it means is that the existence of this hoax is almost certainly a hoax! It’s a good story, the kind that people might enjoy believing, but there’s no evidence to suggest that this prank ever happened. Still, it’s been repeated and shared many times since its first reference in 1862. I remember hearing about it in elementary school over a hundred years later. But there’s no evidence that this ever happened. How could people be gullible enough to keep sharing a story without checking its veracity? Who does that? That might be a good question to ask yourself the next time you want to forward that unsourced story someone posted on the internet!